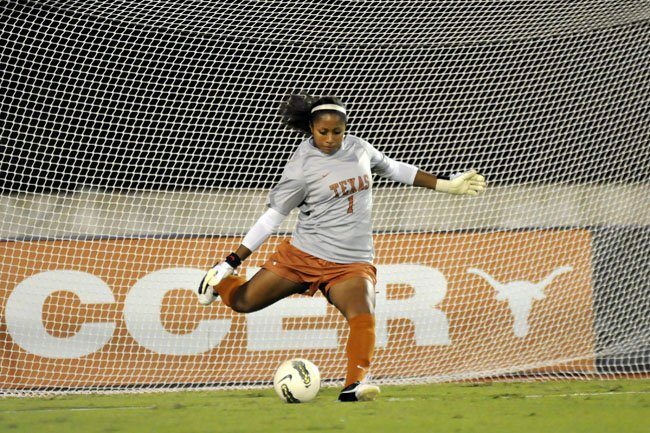 AUSTIN, Texas — The University of Texas battled through a scoreless first half against No. 5 North Carolina Friday at Mike A. Myers Stadium, but then surrendered two goals in the first four minutes of the second half en route to a 2-0 loss that leveled the Longhorns’ record at 1-1. (Continued from above) The Tar Heels got the only goal they would need when midfielder Cameron Castleberry pounced on a Texas turnover and slipped it past UT goalkeeper Abby Smith from four yards out. Minutes later, UNC’s Joanna Boyles fired a shot inside the right goalpost to put the Heels ahead, 2-0. Kelly said after the game that despite the loss, the Longhorns did many things well against an exceptional team. For her part, Smith said part of her focus after giving up the goals was maintaining her focus moving forward. North Carolina enjoyed a lopsided 23-7 edge in shots, but the Longhorns had their chances to close the gap, which Kelly said could have ignited the crowd of 2,195. "I would've loved for us to get one in the back of the net for these fans. Thank you to all of the fans. I thought the atmosphere was electric." The Longhorns have little time to stew about the loss, as they have less than 48 hours to get ready for a Sunday showdown with No. 18 Ohio State. "I thought we could have possessed the ball a little more,” Kelly said. “We gave away the ball too much, but we're going to reorganize and get ready for Sunday."